3D printers allow highly complex objects to be created with ease, and none more complex than biological tissues. 3D bioprinting uses conventional 3D printing technology to create living tissues comprising a scaffold, human cells, and the growth factors that allow the thrive and mimic the properties of tissues in vivo. These 3D bioprinted tissues have tremendous value to researchers who can use them to study diseases and test new drugs to target those diseases. 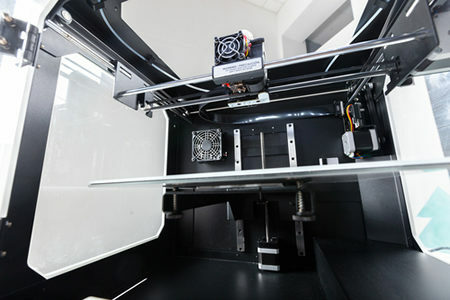 One of the main problems with 3D bioprinting tissues is the development of bioinks that are compatible with printing and allow the cells to survive the printing process, along with the structural elements that ensure the printed tissues retain their structure after the printing process has been completed. Significant advances have been made in the field in recent years, with another success coming from researchers at Northwestern University. The researchers have successfully 3D printed a bile duct mini-tissue. Ming Yan and his colleagues created a bioink from bile duct cells (cholangiocytes), growth factors, signal molecules, thiolated-gelatin, and peptide amphiphiles. Peptide amphiphiles are molecules that can self-assemble into structures. The peptide amphiphile scaffold serves the same purpose as the extracellular matrix does in vivo, forming the structure on which the bile duct cells can grow. The researchers mixed the bioink at 37°C and printed their nanotissue at 4°C. The researchers demonstrated the resultant nanotissue contained filaments that retained integrity and were capable of supporting multiple layers of cells. The researchers stabilized the structure using a crosslinking strategy using an ethylene glycol derivative (homobifunctional maleiminde-poly) with calcium ions. The resultant tissue was highly stable and survived and retained its structure for more than a month at 37°C. This is the first time that researchers have successfully used peptide amphiphiles in a bioink system for a specific biological application. The team is now working on optimizing the peptide concentration in the bioink and including various other signaling molecules to encourage the formation of functional tubular structures akin to those seen in human liver tissue. Details of the achievements can be found in the paper – Tailoring nanostructure and bioactivity of 3D-printable hydrogels with self-assemble peptides amphiphile (PA) for promoting bile duct formation – recently published in the journal Biofabrication (10 035010).